The Dodge Durango dominates the SUV scene with its style, room, and technology in Athens, TX. You can have it all and then some when you trade in your current vehicle toward the Durango. Isn’t it time your family upgrades to the best SUV on the market? Let our staff at Palestine Chrysler Dodge Jeep Ram Fiat fit you with the Durango that meets everyone’s need, no matter how picky. Family comes first, and finding an SUV that has room for every family member and their stuff is easier than ever when you test drive the Dodge Durango. This mid-size SUV seats up to seven passengers and gives you more than 50 ways to configure the seats for optimal comfort and storage. Comfort has been upgraded in the Durango. You can customize your seats from 10 different fabrics that include cloth and leather-trimmed. Making the Durango a member of your family is as easy as picking your favorite color for the exterior and selecting the seats to match. You will have your pick of entertainment and technology features, so your family can decide what will really make everyone happy. Starting with the Uconnect 4 and Uconnect 4 NAV, you can decide what’s important to make each drive the best it can be. For the families who want it all, you’ll want the Uconnect 4 NAV system that gives you an 8.4-inch touchscreen and access to SiriusXM Guardian Navigation, SiriusXM Traffic Plus, and SiriusXM Travel Link. You will be all set for any trip, whether it’s down the road to Pizza Hut to pick up dinner or the whole fam is headed to Disney World in Orlando, Florida. To keep everyone entertained while on that long drive to the sunshine state, you have the option to install a 9-inch dual-screen Blu-ray Entertainment System with High-Definition Media Interface for your kiddos in the second-row passenger seats. They can watch Finding Dory or Frozen on repeat and won’t be kicking the back of your seat out of boredom. To keep you and your partner from zoning out too badly on those long, flat drives, you can enjoy easy access to your favorite radio station presets thanks to the available memory feature in the steering wheel. Your Durango can memorize settings for two different drivers, so you won’t have to take the time to readjust your seat or steering when it’s the other person’s turn to drive. 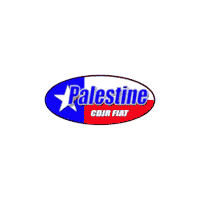 At Palestine Chrysler Dodge Jeep Ram Fiat, we know your family needs an SUV that’s advanced enough to keep everyone engaged and excited about driving in a car for hours on end. With all the features the Dodge Durango has to offer, the only hard thing will be saying no to any of them.